The Lemon Cottage is one of the newer apartment cottages at the Quintassential, a light & airy 1 bedroom cottage with a large bedroom that has a double bed, digital security safe & patio doors leading on to the sun terrace. The bedroom is large enough to also accommodate a single childs chair bed orcot too. The bedroom also has a 21 inch TV with DVD player & UK free to view TV channels. The bathroom has a new luxury bathroom with shower, washbasin with vanity units under, WC, bidet & shaver point. The spacious lounge/diner is decorated tastefully with pine furniture & has a large comfy leather sofa, 36 inch widescreen TV, Satellite TV (UK free to view channels), video player (small selection of videos available), DVD player (small selection of DVD’s available), radio/CD player (guests to bring own CDs), puzzles, chess set, playing cards, Domino set & patio doors leading onto a private terrace with tables & chairs, brick Bar-B-Q’s & reclining chairs. 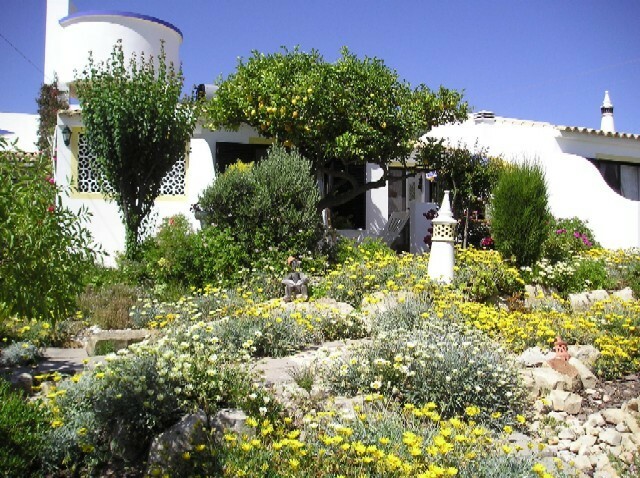 The Lemon Cottage has the added benefit of it’s own lemon tree on the terrace to give you added natural shade. The brand new modern kitchenette comprise of fridge with freezer compartment, combi microwave oven, electric kettle, filter coffee machine, toaster, mini electric oven, filter coffee machine, hand held electric blender & electric hob. 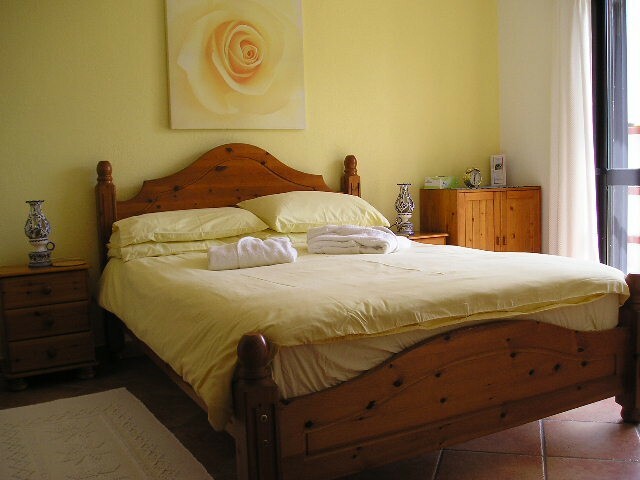 The Lemon Cottage sleep a maximum of 2 adults and 1 small child in the cottage & has the added benefit of gas central heating for the cooler winter months. This is already included in the price. 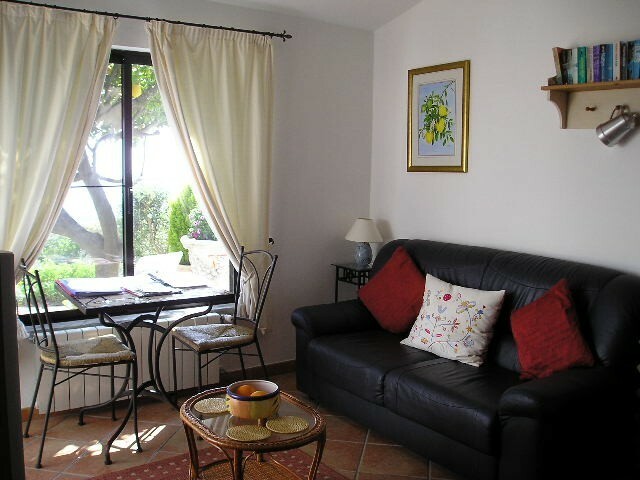 The Quintassential Algarve Holiday apartment cottages are 4 self catering baby/family friendly apartment cottages, 1200 feet above sea level in the Central Algarve all with sea views & equipped, furnished & decorated to very high standards & 15 minutes from the airport. The Quintassential is open all year round so that guests can enjoy the 3000 hours of sunshine the Algarve has to offer. We understand that with low cost airlines it may be better to travel on days other than Sunday or Thursday, so we are flexible with our arrival & departure days. The accommodations can be let individually or together for large parties & the cottages cater from 2 – 10 adults & there is large pool, heated during the winter months, freestanding hot tub spa Jacuzzi, children’s play area & games area. There are 3 one bedroom accommodations & a large two bedroom apartment cottage. Two of the accommodations also have gas central heating. There is also free Wi-Fi internet access for guest use. The Quintassential occupies an acre of hilltop set, totally fenced & accessed via electric gates in breathtaking Algarvian countryside in the centre of the sunny Algarve in total peace & tranquillity 15 minutes from Faro International Airport & the coast & overlooking the market town of Loule. 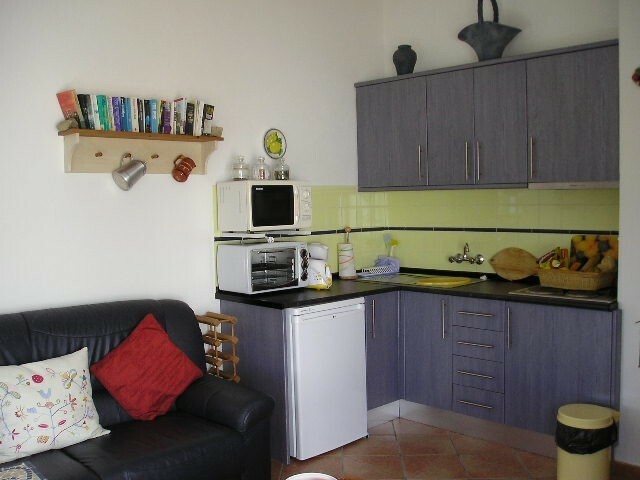 There are spectacular panoramic sea views from Faro to Portimao. Parts of the Quintassential date back to mid 19th Century & are divided up into 4 cottages, 1 large 2 bedroom apartment cottage, Orange & 2 newer 1 bedroom apartment cottages, Lemon & Carob & a rustic duplex cottage, Casa do Forno. All have their own separate entrances, own kitchens, private south-facing sun terraces & brick built Bar-B-Q areas. All accommodations have been furnished to a very high standard with cane & pine furniture. Outside The Quintassential is blessed with panoramic sea views and spectacular countryside views, just what you need for a tranquil & relaxing holiday. 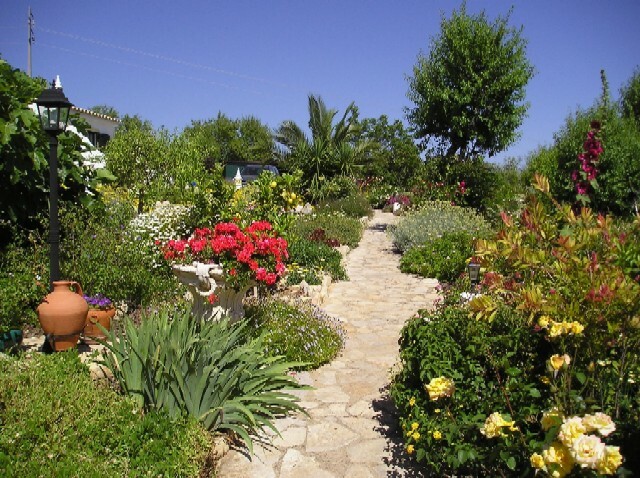 The gardens at Quintassential are simply marvellous, seeing is believing, with many bushes, plants & fruit trees, along with quiet areas to relax & absorb the views. The Quintassential has a large pool area, measuring 10 x 5 m with cushioned sun loungers, parasols etc provided for the use of the guests. There is also located on the pool terrace a hot tub spa Jacuzzi for guest use. The pool is heated during the cooler months from 1st October until 30th April & there is no additional charge for heating the pool. There is also a children’s play area with swings, slide, see-saw all amidst an orange grove. For those who have a little more energy, there is an outdoor games area with a professional size table tennis table available for guest use along with table football (foosball) and an exercise bike. There is also a 12ft trampoline with safety enclosure and a pool/snooker table for guest use. On arrival the owners will meet you & awaiting your arrival will be a very generous welcome hamper in your accommodation compliments of the house for guests staying a week or more. For all the adult guests, bathrobes are provided for use during their stay, pool towels are provided to use only at the Quintassential & the accommodations have hairdryers, alarm clocks, irons & ironing boards. Guests will need to bring their own beach towels. There is a laundry service available for guests staying at the Quintassential for a small additional charge payable locally. All the accommodations are non-smoking and car hire is essential. We do everything possible to ensure that families with children have a holiday that is both fun and relaxing. With children of our own we know how important it is to keep kids happy & entertained on holiday, within a safe & secure environment. The Quintassential is totally fenced & accessed via electric gates, so a very safe place. There is a lot of space for children to play and to discover nature, play with Alfie our children loving dog, we have two dogs and three cats in total. The accommodations are all separated from the pool area, the pool area is enclosed & gated to give parents of toddlers that extra piece of mind. We have a children’s play area available designed for little ones situated on a large lawned area amongst an orange grove. There is a slide, swings, seesaw, playhouse etc, this area adds an exciting dimension for all the visiting children & keeps them occupied for hours. There is also a seating area for adults to relax, unwind and top up their tans. Our accommodations are available to rent separately or together (subject to availability), which provides the perfect opportunity to bring grandparents or child minders along too. We are also pleased to be able to provide BABY WELCOME PACKS. The Quintassential in association with Little Rascals Baby Shop would like to give you the opportunity to make your holiday with small children run as smoothly as possible. The exclusive Baby Welcome Pack service is designed to reduce the stress of traveling with young children, reduce the amount of extra luggage needed & eliminate the difficulty of searching for familiar baby products in another country. Little Rascals is based in the central Algarve and stocks a wide range of UK baby products. The Welcome Pack will be delivered free to your accommodation here at the Quintassential prior to your arrival. Due to the recent changes in baggage allowance by many of the airlines, Little Rascals also hire Travel Cots, Car Seats & Push Chairs. For further information regarding which products are available, please refer to our website. We are also pleased to announce a baby sitting/child minding service from a British qualified nanny/nursery assistant. One weeks accommodation for 2 adults, gas central heating, pool heating, welcome hamper and a group B hire car for £395.00 GBP per week. Flexible Arrival Day. Full directions provided at the time of booking confirmation.